Tattoos » Page 5 Now viewing page 5 of 7. 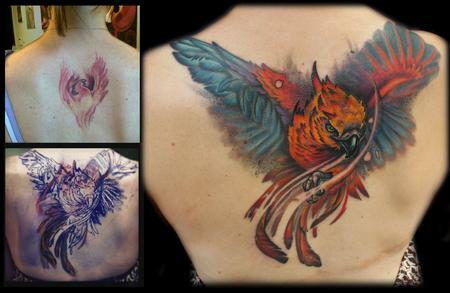 This is a coverup shoulder tattoo that will eventually lead into a full wrap half sleeve. the client had a ball and socket chain arm band. 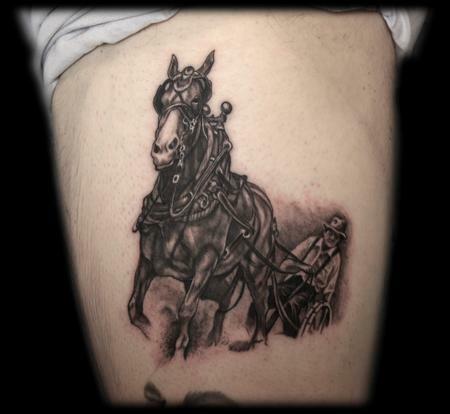 it was a tricky coverup because of the heavy lineweights and dense black and grey shading. here's a black and grey filigree arm sleeve tattoo. Drawn on and completed two days in a row on a gentleman at the Park City Tattoo Convention. 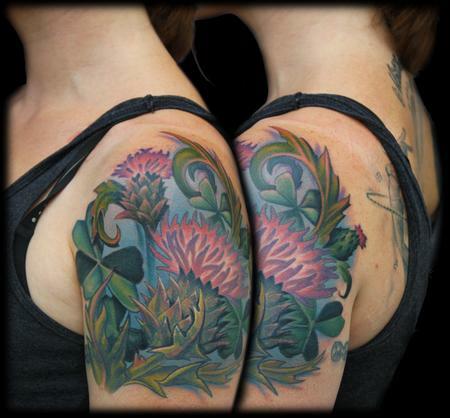 The top section shoulder cap was done by the phenominal tattoo artist, Megan Hoogland. Her work is really inspiring and it was an honor to work into and along side her art. Looking forward to get healed pictures. Really tryed to play with dimension and layering the filigree inorder to give it density without cluttering the piece. I love doing these types of tattoos. Looking forward to doing more. 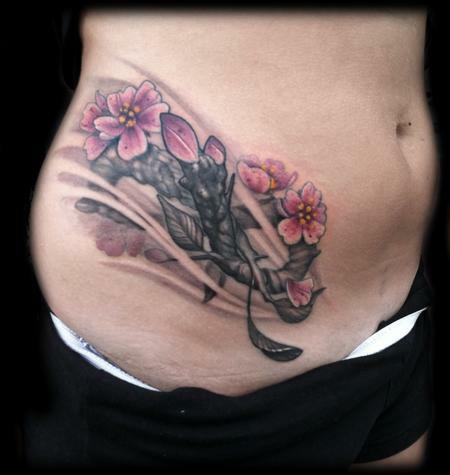 The client approached me with the idea of putting a infinite symbol on her hip but making it out of a cherry branch. She had also mentioned that she'd seen the apple branch tattoo that i'd done prior and liked the mix of the color and black and grey. 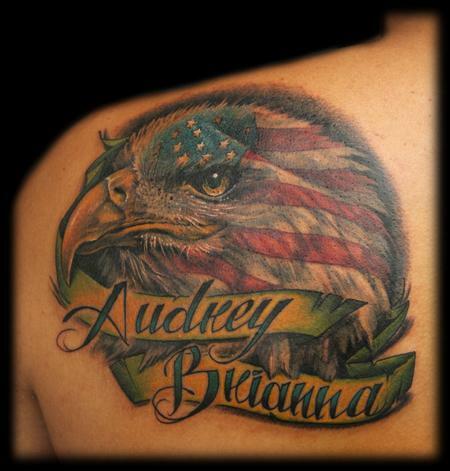 the client approached me wanting to incorporate his time in the u.s. military and his brazilian heritage along with the names of his two daughters. This one was part of my "3 freehand skulls in 3 days" series. The client approached me wanting a skull turning into a a baseball splitting apart. 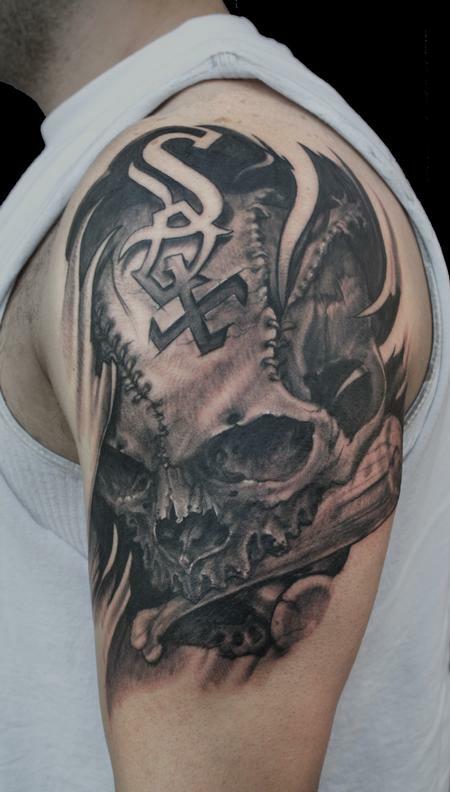 He also wanted to have crossed bone bats and somehow incorporate the white sox logo. It was quite a bit to put into one tattoo but here's what I came up with! Had a blast doing this one, especially because I used a "from life" reference! client approached me wanting to cover up an unfortunate phoenix tattoo she'd gotten a while back, her request "I want a phoenix to cover my phoenix. I had a really great time doing this one, and it was alot to play around with abstracting the wings to give them a hot and unpredicable nature. thanks for looking! 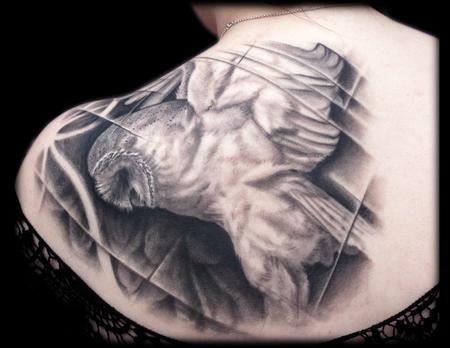 here's a black and grey barn/snow owl abstracted shoulder tattoo. i played around with the effect of abstracting and disjointing the image like broken glass/ mirror would. i also stipple tattooed the top of the head inorder to give it a peppered look. the background, although subtle is a close-up of a pinecone tattoo with negative spave pine needle to break up the top edge and add a little flow. thanks for looking! 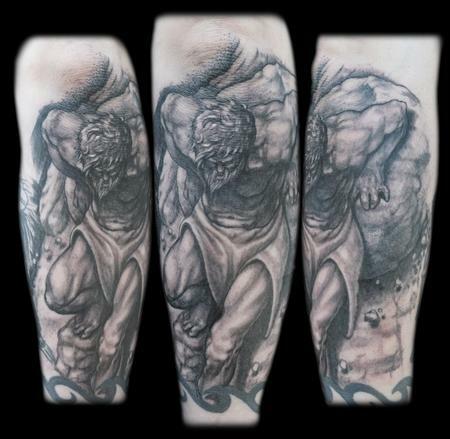 This is the first installment of a myth or legend of sisyphus sleeve tattoo. 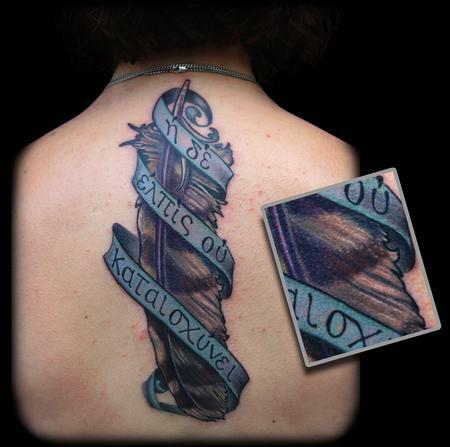 here's a freehanded (drawn on) with tombow markers, color barred owl feather tattoo. we incorporated a banner with ancient creek scripture into the tattoo. the client brought in the feather that she had found after her father passed on. was very happy to do this really neat and meaningful memorial tattoo. 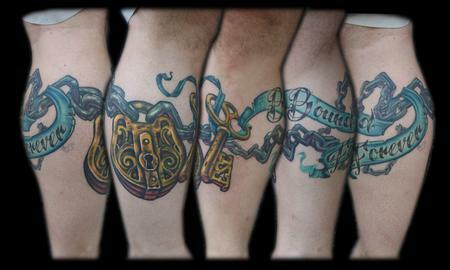 this is a color skeleton key tattoo and antique padlock tattoo, chain and banner tattoo. the client wanted to incorporate all of these different elements into a positive bound feeling for his daughters. i included their initials into the teeth of the key. had a really good time doing this one. really fun tattoo to do! the client and i are adding onto and existing leg sleeve tattoo with the theme of evolution. my contribution and furthering to finish, is examining man's role of industrialization. starting with the enslavement of land and animals and then ending with our own enslavement to the system we've created. there's a long way to go on the leg and can't wait to work on it again. i'd really like to do more tattoos of these types of themes and story lines. had a blast with this one! it's been a long time in the making too! 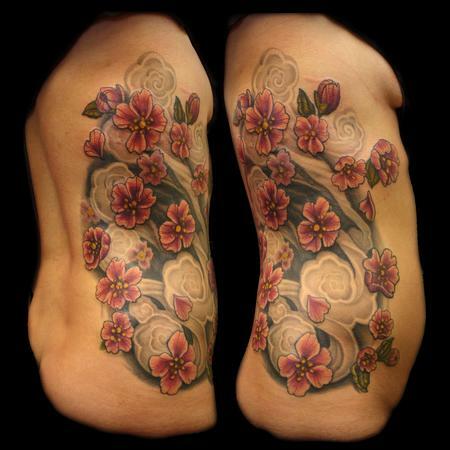 the client approached me with the idea of doing the sagittarious constilation with cherry blossoms to honor her japanese heritage outside of that she gave me free reign. i started this one after last year's paradise tattoo gathering. i drew this one directly on the skin. still needs one more polish sitting, but like it too much not to share! hope you like! Now viewing page 5 of 7.